If you’re a perfectionist like me, you probably have a tendency to slip into all-or-nothing thinking (i.e. it’s either perfect or I’m not doing it at all) to protect yourself from the judgement and criticism that you think will come from others if you fail. 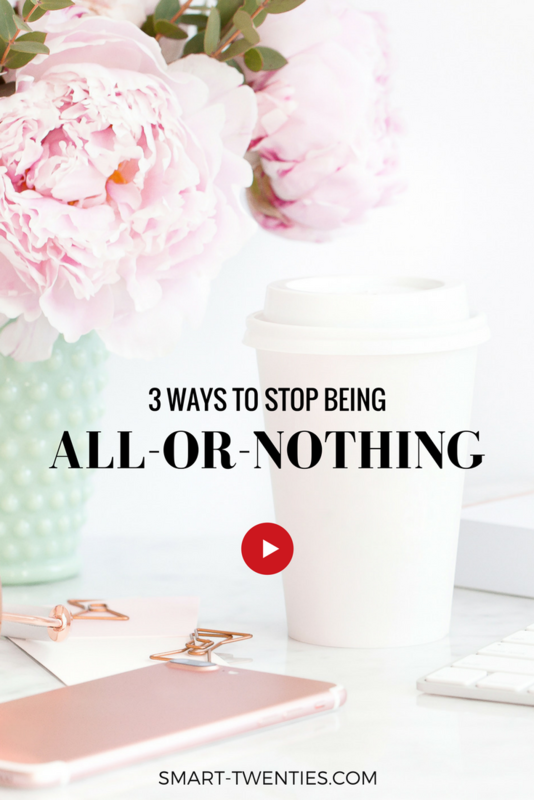 In this YouTube video, I share three pieces of advice to help you stop all-or-nothing thinking so that you can stay consistent with habits and goals. I hope you find this video helpful and I’ve also shared a few key points below so it’s easy for you to follow along! 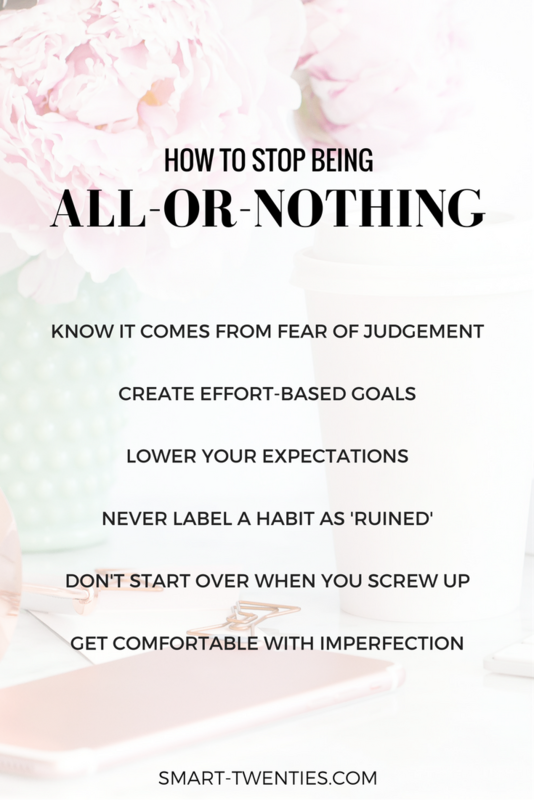 Because perfectionists only want to do things they’re good at (because we feel like this will protect us from judgement and rejection) our all-or-nothing mindset can kick in when we’ve working towards a goal and it begins to look like we won’t achieve it. So that this doesn’t happen, create effort-based goals. Effort-based goals are AMAZING because you’re much less likely to feel disheartened which means you’re much more likely to achieve the result you want – because you can stay consistent! I’m aware this is easier said than done, but setting yourself very small effort-based goals (such as going for a 5 minute run rather than a 5km run) can help you stay consistent with a habit even when you ‘don’t feel like it’. This one is particularly important because perfectionists usually have insanely high standards and those standards are often so intimidating that we’re scared to even attempt to live up to them. Try lowering your expectations and giving yourself the opportunity to over-achieve (rather than trying to over-achieve and feeling disappointing when your expectations cripple you). When you’re unwell or injured or something happens that means you simply can’t do your dream habit that day, give yourself what I like to call a ‘grace day’. I love doing this because the alternative is that we label our habit as ‘ruined’ and vow to start over next Monday or next month or next year. But if you find yourself trying to decide whether you should give yourself a grace day, you probably shouldn’t. This is just an option for when something happens that makes it impossible to do your dream habit. I hope this helps! And if you have any questions, please let me know in the comments.